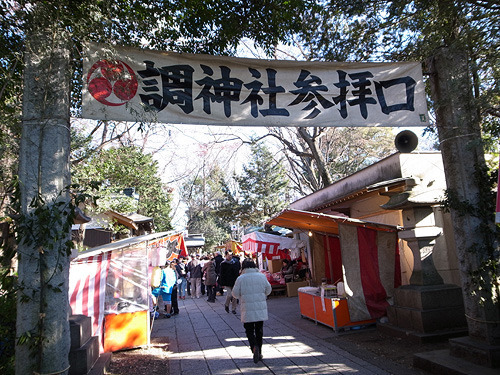 Japanese people have the custom of getting a new lucky charm during our first visit of the year to a shrine or a temple. 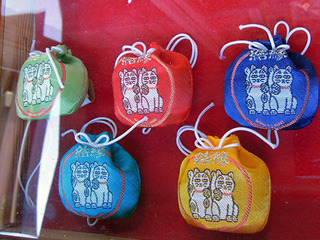 We have many kinds of lucky charms, but we choose just one or a few according to the effect such as for good match, good health, easy baby birth, safe driving, school success, business success, and so on. Usually we don’t care so much about the charm’s appearance. 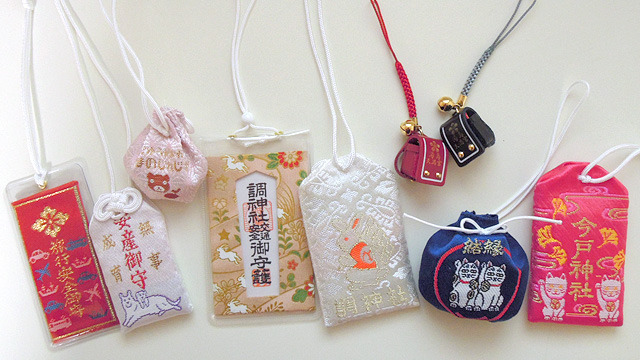 till, there are a lot of kawaii (cute) lucky charms to be had. 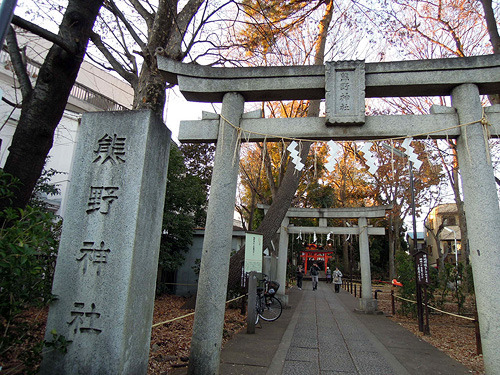 Today, I would like to introduce our blogger, Ms.H, as she journeys to look for kawaii lucky charms around Tokyo. Effective for good couple match and happy marriage. 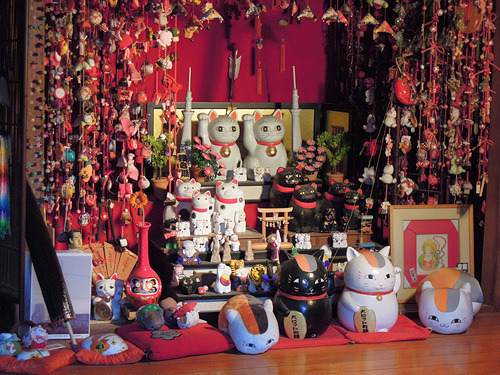 Many Maneki-Neko (welcoming cats) are displayed. 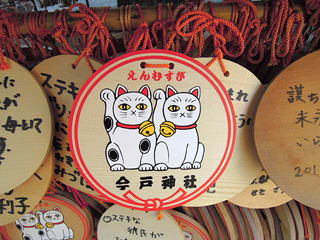 There are even cats on votive tablets too. 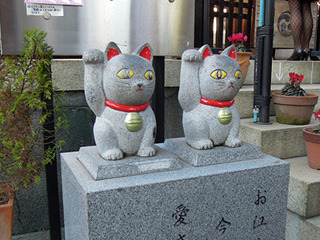 Stone statues of welcoming cats. 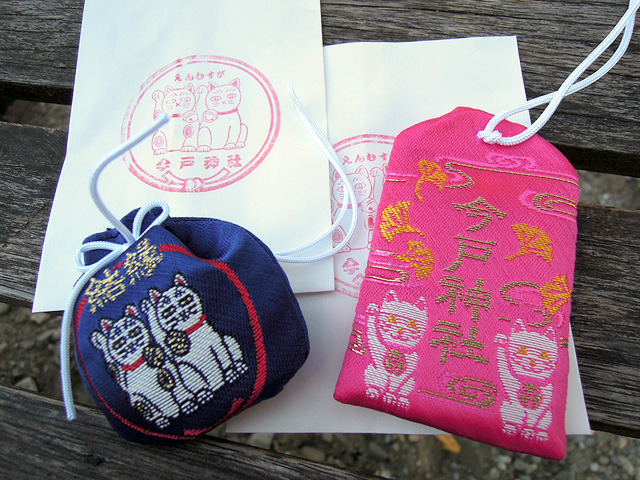 Imado Shrine has many cute lucky charms XD! Ms. H chose the ones in blue and pink. 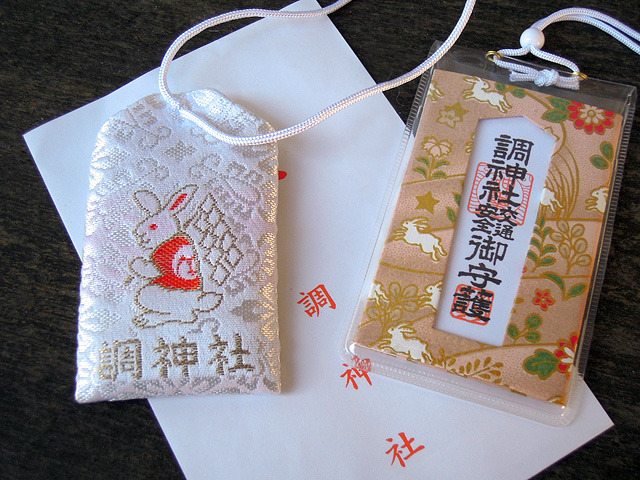 The stamp on the paper bag is also lovely (^^). 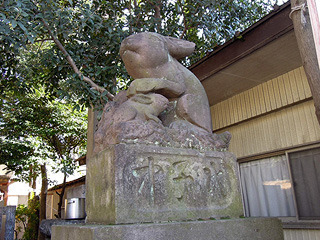 [Tsuki Shrine: Saitama ] Mascot animal is rabbit. 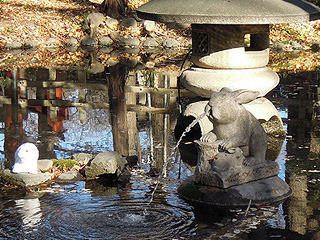 Usually there is a fox on the stone base. 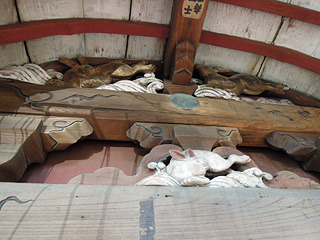 Rabbit motif decoration on the wall. 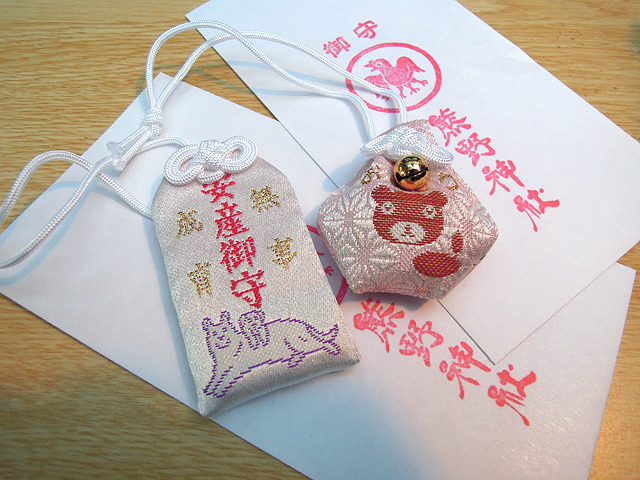 This is Tsuki Shrine’s lucky charm. White makes it look very noble! 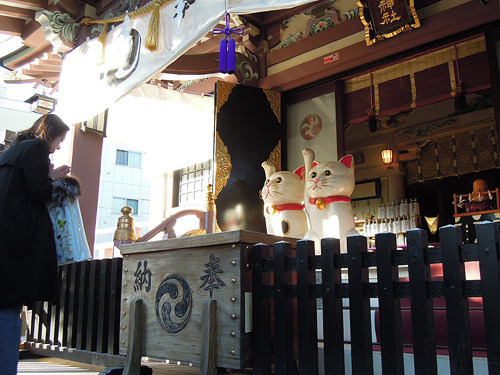 [Kumano Shrine: Jiyugaoka, Tokyo ] Mascot animal is bear. Wow! 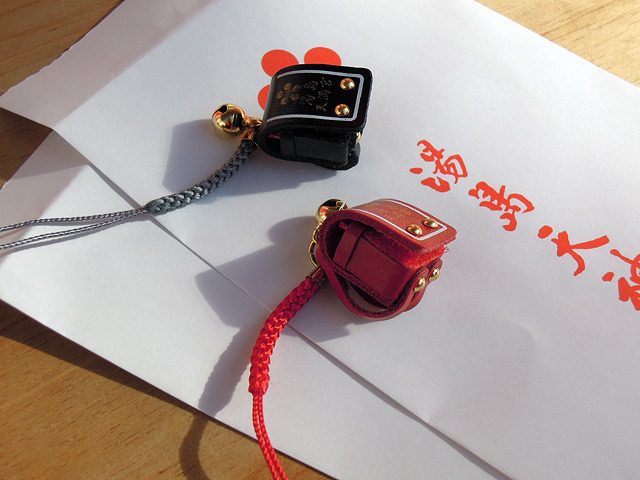 These are really lovely XD! The left one is for easy baby birth. Ms.H is not expecting a baby but got one because it’s cute LOL. 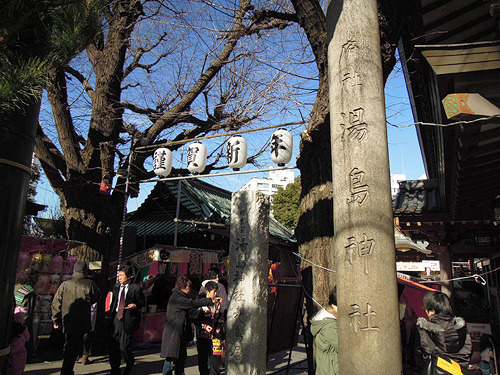 [Yushima Tenjin: Bunkyo-ku, Tokyo ] Effective for school success. 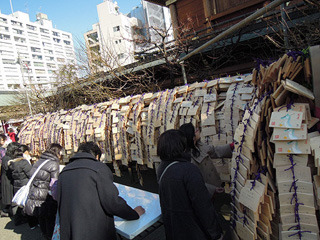 Tons of votive tablets with serious wishes for school success! 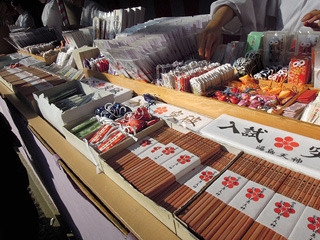 Pencils also can be lucky items here. 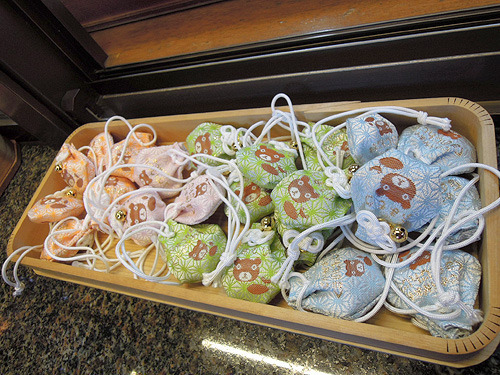 Japanese school bags (called randoseru) motif lucky charms. These are amazingly lovely and elaborate!